A baseball player is always going to remember his first appearance in the show: whether it be on the pitcher’s mound, or next to home plate–it’s going to be engraved into his memory forever. I sometimes wonder how it feels. Unless he is getting the borderline ridiculous hype that Stephen Strasburg is getting, he might be relatively unknown. Not everyone follows the minor leagues, but I think they are really exciting. Watching a minor league game is like gazing into a crystal ball because it’s a glimpse into the future. It also makes a player’s debut that much more exciting because in a way, you have shared a part of his journey. Daniel Nava’s journey was certainly a special one. Nava isn’t the typical story of the star prospect drafted in the first few rounds making his debut after tearing up the minor leagues. That’s a story that you will get if you read about Buster Posey (Giants), Jason Heyward (Braves), Carlos Santana (Indians), Starlin Castro (Cubs), Stephen Strasburg (Nationals), or Mike Stanton (Marlins). Nava was cut from his college team, and cut from the Golden League (part of the Independent Leagues). He was never built like a baseball player. In his freshman year of high school, he was shorter and smaller than I was. The odds didn’t stop him though–he never gave up on his dream. He overcame adversity and went back to the Golden League when his team had a void that they needed to fill. I was at his Double-AA debut last summer when I was in Portland. He had a hit, which really impressed me because the jump from Single-A to Double-AA is considered to be the toughest by many. Nava was assigned to Triple-AAA Pawtucket this season, and he has been consistently tearing it up for the entire season. Upon being called up, he led the PawSox in batting average at .294, home runs with eight, RBIs with 38, OBP at .394, and a slugging percentage at .492. Despite these stellar numbers (and the numbers that he has put up since signing with the Red Sox), he often flew under the radar due to his draft status (or lack thereof). Outfield prospects like Ryan Kalish and Josh Reddick get a lot of attention (deservedly) due to their high draft status. While I am certain that they will help out the Red Sox at some point in the future, they are still developing. Why wasn’t Nava called up earlier then? The way I see it, calling up Josh Reddick first was a great move–especially after the torrential spring training he had. The Red Sox obviously want to get his feet wet because they consider him an integral part of the outfield of the future. Then they called up Darnell McDonald, who is a minor league veteran (since 1998 or 1999), and has also had experience around the Majors. Nava’s consistency and overall performance certainly warranted a call up at some point this season, and I’m glad that the organization felt the same way. It has been said that this is the year of the pitcher, and I don’t doubt that. There have been two perfect games, a no-hitter, and a 28 out perfect game (among other spectacular performances). Wouldn’t it also be fair to call this the year of the rookie as well? Jason Heyward hit a home run on the first pitch of his first at-bat on Opening Day. Starlin Castro had something like six RBIs in his debut. Mike Stanton had two hits in his debut. Stephen Strasburg, whose curveball is the best thing I’ve seen since Timothy Lincecum’s slider, had 14 strikeouts. Darnell McDonald isn’t really a rookie, but he had a home run and a double to tie and win the game in his Red Sox debut. 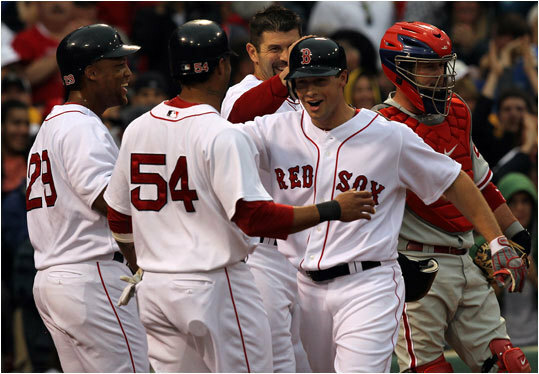 There’s nothing quite like Daniel Nava’s debut though. Coming up with the bases loaded in your first major league at-bat is probably something he dreamed about as a kid. A single or a double would have brought Red Sox fans and baseball fans alike a smile. Nava went above and beyond though. 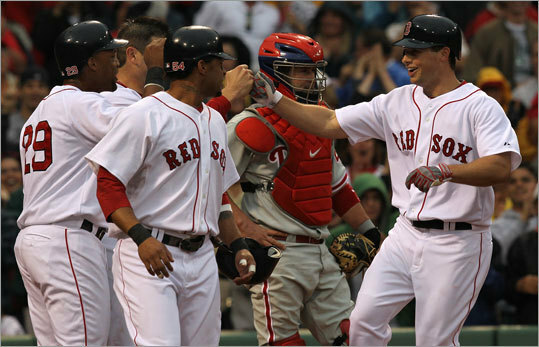 On the first pitch of his first major league at-bat, Daniel Nava crushed a grand slam into the bullpen. His approach, impeccable; his style, instrumental; and his debut was priceless. Nava joins a very elite club. 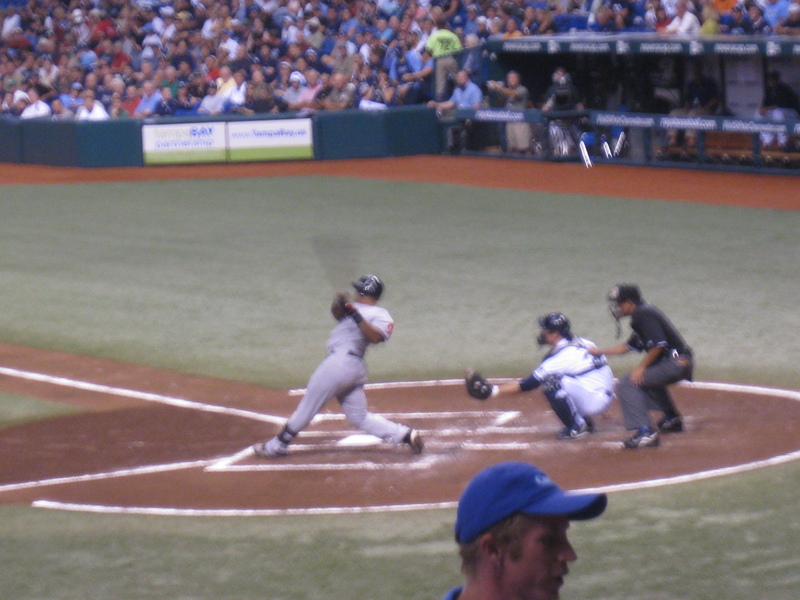 He is only the second person in Major League history to hit a grand slam on the first pitch of his first at-bat; the other being Kevin Kouzmanoff in his debut with Cleveland in 2006. He also became the fourth guy to hit a grand slam in his first at-bat (first pitch or not). The Red Sox now have two guys who have hit grand slams in their first at-bat in the Majors: Nava, and a victim of Adrian Beltre’s wrath: Jeremy Hermida. I remember watching that at-bat in 2005: his debut with the Marlins. When he was signing for me during Spring Training, I mentioned it to him. The grin that came to his face was indicative of the significance of that memory to him. I asked him which pitch it was on, but I couldn’t hear his response because everyone around me was yelling. I’m a bit embarrassed to admit where I was during Nava’s at-bat. I was taking a nap because the ACT had completely wiped me out. The fact that I missed this monumental occasion reinforces my deep hatred of standardized testing. When I went to watch the game with my dad, he said, “Just guess what Daniel Nava did in his first at-bat!” “A grand slam?” I guessed. I guessed correctly! But when my dad mentioned that it was on the first pitch, I was in shock and awe. I could not have been happier for him. He is truly an inspiration for people to never give up on their dreams. The only thing I see left for him to do–and this will be the true test of his ability–is to call Adrian Beltre off. If he can do that at some point, he can stay as long as he likes! I actually want to talk about Beltre for a second. It’s not like he fractured Ellsbury’s and Hermida’s ribs on purpose. He was just doing his job. He goes after every single ball as hard as he can. I don’t think anybody can blame Beltre for trying to do his job. As Terry Francona said, the ball was falling in a place where neither man could call it. My understanding is that a player should only call a ball if he is absolutely positive that he is going to catch it. If the ball is falling into No Man’s Land, and neither player is sure that he will catch it, then neither player should call it! Now since Beltre has clearly demonstrated that he can catch up to that ball and catch it (it fell out of his glove after he collided with Ellsbury), then perhaps he should make those plays from now on. 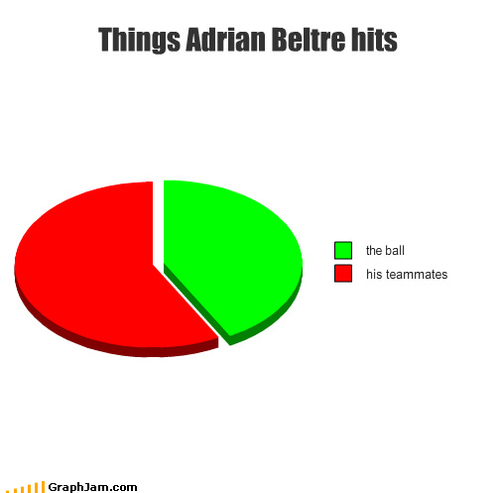 All I’m saying is that we can’t blame Beltre for playing his heart out. 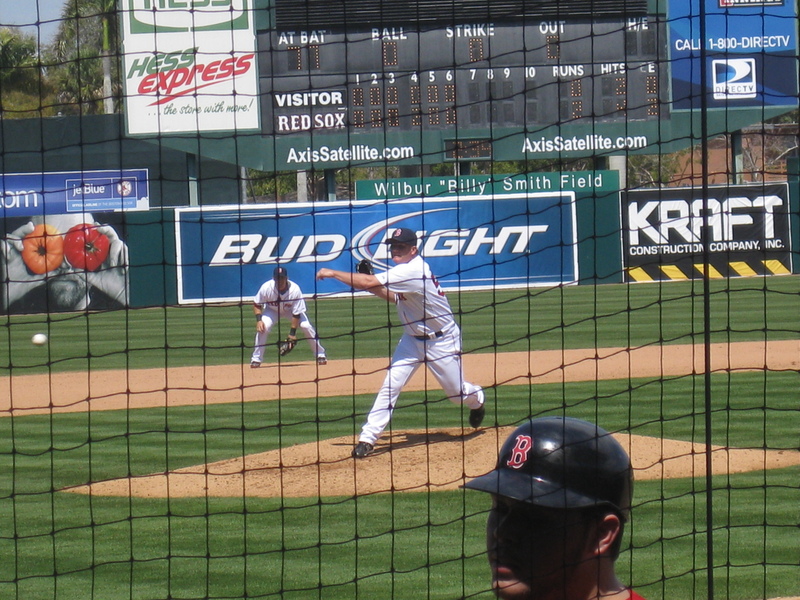 Upon waking up from my nap, my dad also informed me that another pitcher was called up from Pawtucket: Dustin Richardson. I was beyond happy to hear that he was finally called up. I have been very excited about him since spring training of 2009, and it was an absolute pleasure to be able to speak with him a couple of times during this spring training. I thought he was perfectly capable of starting this season in the bullpen, but he told me that he had a couple of things to work on in Pawtucket. He made his major league debut last September, and he did so well that I thought he was capable of pitching in the postseason. If you are not as familiar with him, you can click on his name in the tags section at the bottom of this entry to read what I have previously written about him. There is a possibility that he will only be up until Dice-K returns from the 15 Day DL (late scratch last night due to a stiff forearm), but if he pitches the way that I know he will, then the Red Sox might be lucky enough to have him up the rest of the season. 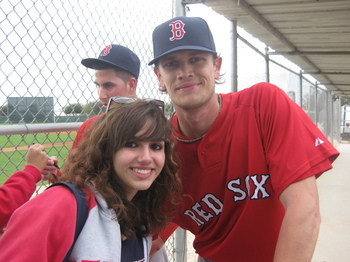 I hope that I’ll be able to see him when I go to the Giants vs Red Sox game later this month! I’m pretty sure that I say, “Bring Dustin Richardson up!” at least once during every game, and I probably tweet it every night. 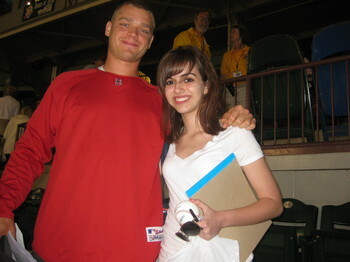 I hope he doesn’t forget about me now that he’s a big Major Leaguer. 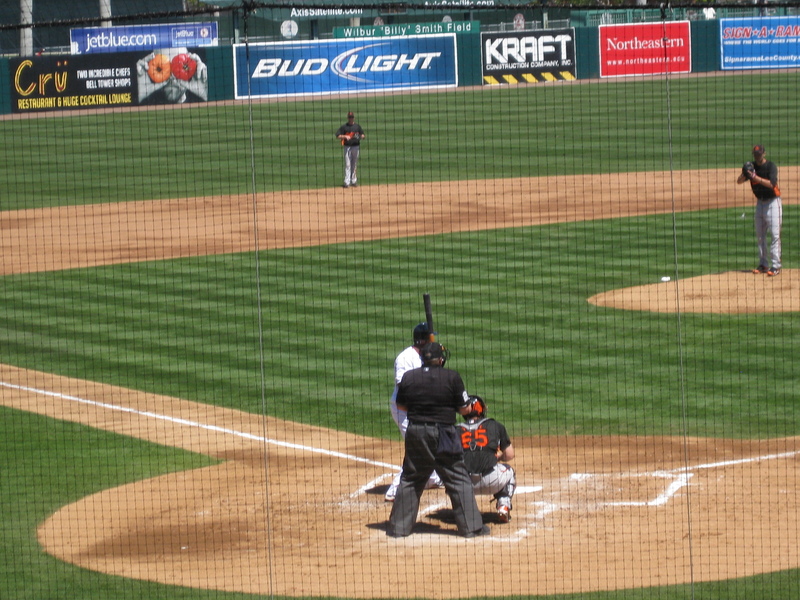 In his first outing of the 2010 season, Richardson got two outs on three pitches. That’s more efficient than Stephen Strasburg. Tampa unless the gods of Interleague play decide to work in my favor. see an alligator. You will only see trees. French final the next day. inside, but it ended being alright. first place we saw, and we got these sausages with peppers and onions on top. the Spring, but not by much. 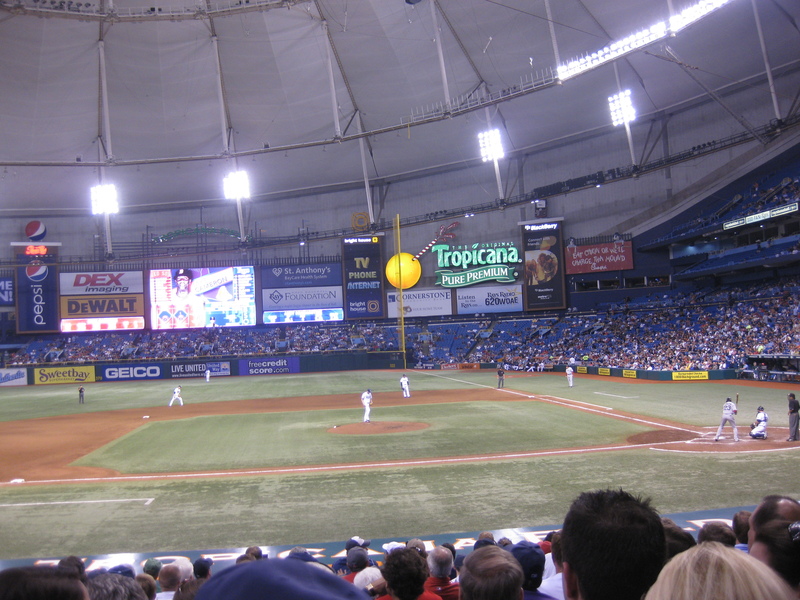 to bet that opposing teams, and especially opposing pitchers, hate playing at the Trop. the game because driving back four hours after seeing a loss would not have been fun. gem, but he pitched well enough for the Red Sox to win, and that’s what counts. Lackey’s main problem was that he was inefficient with his pitches. Nevertheless, his balls to strikes ratio was significantly better than Matt Garza’s that night. double shy of the cycle. He may make errors sometimes, but his bat has been such a valuable part of the lineup. 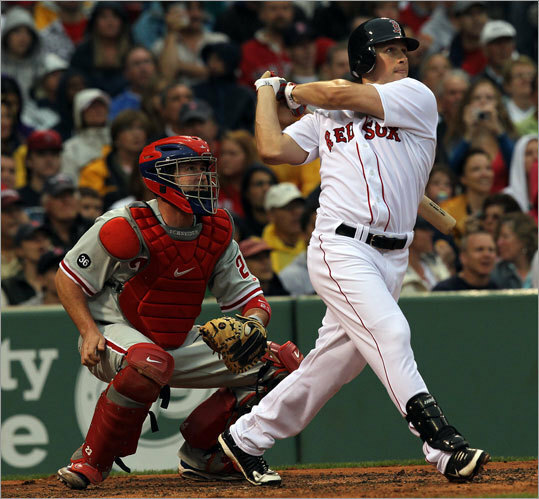 He is among the league leaders in batting average, and has generally been great with runners in scoring position. 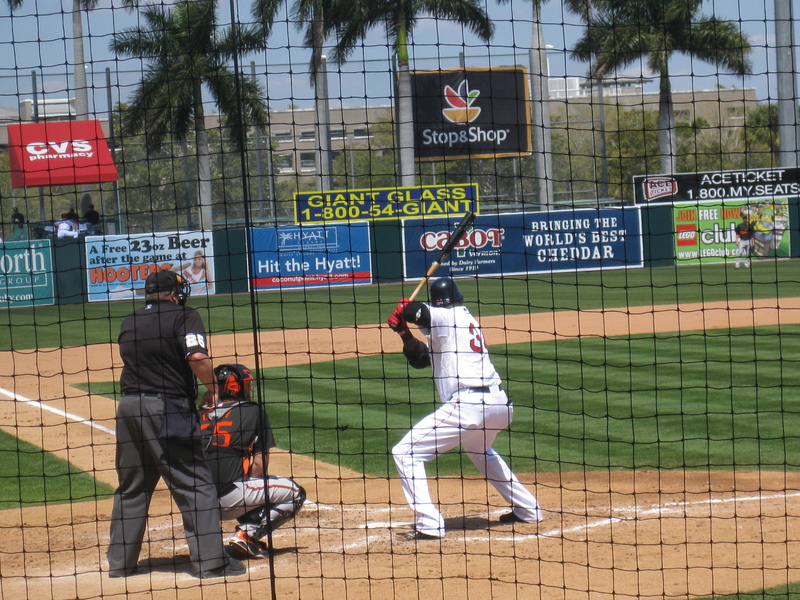 David Ortiz hit an opposite field home run, which was great to see. He really turned it around in May, but I still think mild skepticism during April was appropriate (maybe not during the first week, but after that). He simply was not seeing pitches well in April, and he was always getting behind in the count. Ortiz has struggled during June though. He was something like 1-for-24 on this road trip. 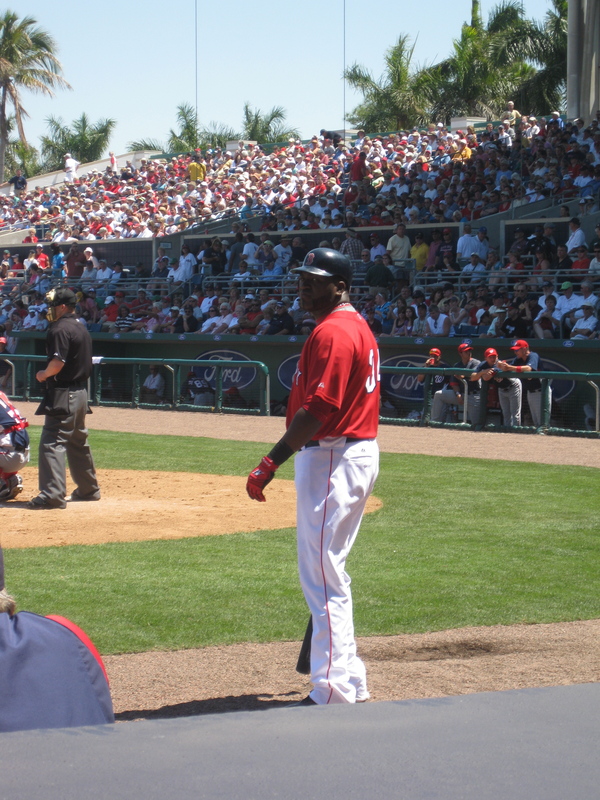 Some people (like Jon Lester and Mark Teixeira) just aren’t April guys, and maybe Ortiz is just one of those guys now. Being at that game was such a great birthday present. The Red Sox offense was just so in sync. By the time the game ended, everyone around me was wishing me luck on my French final. 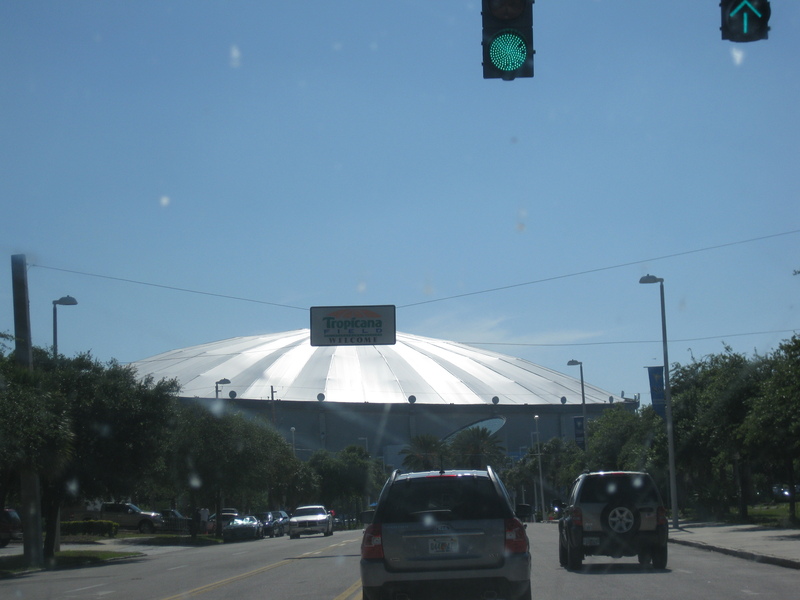 I’m pretty sure that the vast majority thought that I was a bit nuts for being in Tampa when I had a final four hours South the next day. On our way back, my dad and I picked up some 5-hour energy. My dad drank it to keep him alert on the long drive home, and I saved it for the next morning. Believe me, that stuff works, and it actually doesn’t taste too bad. I don’t blame you if you think I’m a little bit crazy for doing this, but I don’t regret it for a second. When my response to “Why do you look like a zombie today?” was “Oh, I was in Tampa last night”, I got some strange looks. If I can’t bring the Red Sox to myself, I’ll bring myself to the Red Sox. I’m kind of upset that my school wouldn’t let me rearrange my finals though. They let other people do that if they were leaving on vacation, or going to their brother’s graduation… but they wouldn’t let me rearrange my finals for this? This is my life. It disappoints me that some people just cannot accept that this is more than just a game for me. Who are they to decide what has more merit? Going to a baseball game or going to a graduation? It’s completely subjective! Passion is relative. This is beyond dedication; this is beyond baseball. The Red Sox are first in the Majors in both runs scored and hits. They are second in the Majors in homers and total bases; and they are third in the majors in slugging percentage and On Base plus slugging. However, when they look up, they see three teams in front of them: The Rays, the Yankees, and the Blue Jays. The Red Sox are in fourth place right now, and it doesn’t really make sense. Before the season even started, people were panicking about our supposed “lack of offense.” However, neither the Red Sox nor myself (among others) were too worried about the offense. As far as offense goes, there is not much to improve upon with those statistics. The Red Sox are in the top three in some of the most important categories. I must admit, though, these statistics took me by surprise; especially leading the Majors in home runs. I was expecting key hits and a little more small ball to get us through the season, not the long ball. I have also lamented many a time about the Red Sox’s struggles with runners in scoring position. Yet they are first in runs scored! So if the offense is so good, then why are the Red Sox in fourth place? It’s because the pitching and defense have not lived up to their expectations, and this is not Theo Epstein’s fault. He went out and acquired the best people he could find. Adrian Beltre is arguably the best third baseman in the league, but he already has an unacceptable amount of errors. Marco Scutaro is also in a similar situation. His eye and ability to draw walks from the leadoff spot has been invaluable and often overlooked, but some of his throws to first base have simply been atrocious. Now I don’t want to hear any of this “we should have kept Alex Gonzalez stuff.” Yes, he has been off to a hot start offensively, but his defense has been anything but pretty. Ever since Nomar Garciaparra’s departure, the Red Sox’s least solid position has been the shortstop. And it will continue to be this way until Jose Iglesias is called up. Mike Cameron has also made some critical errors in the outfield. Some of you may remember that start that Clay Buchholz had, and the easy fly ball that Cameron missed cost the Red Sox four runs. Honestly, I think that the Cameron signing was unnecessary. The Red Sox could have kept Jacoby Ellsbury in center field, and they could have platooned Jeremy Hermida and Josh Reddick in left field. Those of you who follow the Pawtucket Red Sox know that Josh Reddick is struggling with a sub .200 average. He literally had the best Spring Training of all of the Red Sox, and I think not making the team probably took a bit of a mental toll on him, which is totally understandable. I think that he was ready to be with the big league club this year (even if it was just coming off the bench), so when the Red Sox signed Mike Cameron, that probably came as a bit of a slap in the face. On the other hand, Hermida has had some clutch hits for the Red Sox so far this season. Many of the Marlins fans that I have spoken to were so glad to get Hermida off their hands, but I think that having him come off the bench has helped him out. The only problem is that his fielding is sloppy. The other problem the Red Sox have had is inconsistent pitching, as I have mentioned before. Josh Beckett, the supposed ace of our staff, was placed on the 15-Day DL yesterday; and our most consistent starter has been Clay Buchholz. A consistent, dominant Josh Beckett is essential to the starting rotation. Luckily, Jon Lester has significantly improved after his first couple of starts in April, but this seems to be a trend for him. John Lackey has been disappointing thus far. The Red Sox signed him to be like Josh Beckett, but at this point in the season, do they really want him to be like Josh Beckett? I just want him to be himself. Daisuke Matsuzaka is another story entirely. He had one extremely dominating start in which he struck out ten batters and walked none, but he was not able to carry that over into the following start. For the most part, he has had one bad inning in which he simply falls apart, and the Red Sox cannot have this in the starting rotation. Perhaps Tim Wakefield would be more effective in the starting rotation. Perhaps the only reason that it is Tim Wakefield in the bullpen and Matsuzaka in the rotation is because of the significant contract disparity. A couple of roster moves have occurred over the last day or so. With Josh Beckett moving to the DL, reliever and man of the Vulcan pitch Joe Nelson was called up to fill that roster spot. Scott Schoeneweis, who has not been effective out of the bullpen at all this year, was designated for assignment. To fill his roster spot, SS Angel Sanchez was called up. By the way, I was very impressed with Angel Sanchez during the spring. In the minor leagues, Bryan Peterson was called up to Salem to fill Anthony Rizzo’s spot on the roster. Felix Doubront, who was 4-0 to start the season in Portland, was called up to Pawtucket. 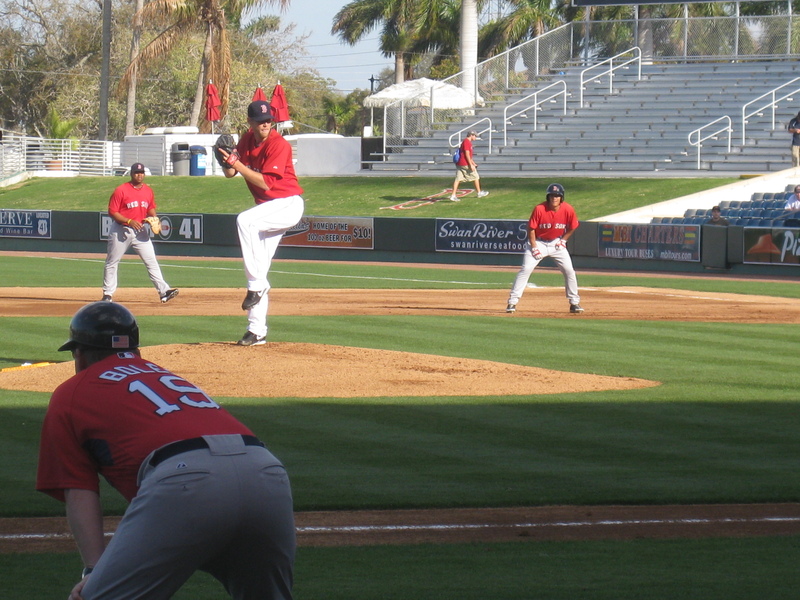 In spring training, there were about four guys competing for a spot in the bullpen: Scott Atchinson, Scott Schoeneweis, Joe Nelson, and Brian Shouse. I was not impressed with any of them. You all know what is coming: my argument for my projects. Tim Wakefield will be moving back to the starting rotation. This makes sense, but another option that the Red Sox have is calling up Michael Bowden for a spot start or two. Remember how I compared him to Justin Masterson? I remember Masterson making some starts in early 2008 and 2009, and he was really effective when the Red Sox needed him, and I have no doubt in my mind that Michael Bowden would do the same. The Red Sox could also use a solid, left handed reliever like Dustin Richardson in the bullpen. He has been nearly untouchable in Pawtucket, and I think that he could be exactly what the Red Sox need coming out of the bullpen. The last problem that the Red Sox have is an internal one. On Tuesday, Mike Lowell confessed his true feelings about his situation to WEEI. He basically said that he knows that he does not have a role on the team, and that he literally fills a roster spot. I know that this type of “attitude” can be detrimental to a clubhouse, but I think that Lowell is perfectly justified in voicing his opinions. He has had such a good attitude through all of this, and I do not think that it is going to have a real effect on how others play. Whenever he is put into a game, he puts in 110% effort. The problem is, he is rarely put into a game. so that the Red Sox can see if he is just going through a funk, or if his career is actually coming to an end. He obviously wants what is best for the team, which is why he mused that the team might be better off without him. Look, I really like Mike Lowell. My dad and I call him the black hole at third base, and he is known as Mr. Double. *Tangent*: My physics teacher told me that he gave his Physics Honors class a question on momentum that had to do with Mike Lowell. The basic point of the question was whether or not the ball went over the green monster, or if it was a double. Without even thinking about the necessary calculations involved, I said that he would hit a double because he is Mr. Double. Unfortunately, I would have only received partial credit. Anyway, I think that Mike Lowell is right. I am sure that there are a lot of teams out there that could really use Mike Lowell if he was only given the chance. Consider the following hypothetical situation: having Mike Lowell play third base and having Adrian Beltre DH. I am willing to bet that we would see some pretty incredible plays from Lowell. Terry Francona was platooning Lowell and Ortiz for a little while when Ortiz was struggling depending on the matchup. But like I said, if Ortiz can maintain some consistency, then this will no longer happen. The Red Sox obviously want to remedy their situation. But going out and buying another bat or trading precious prospects for it is not the solution, and the statistics show you that.It is not realistic for the Red Sox to trade for a starter because four of our five starters are under big contracts. This is why I say we give Michael Bowden a chance. I know he can do it. The fact that the offense is performing so well and yet the Red Sox are still in fourth place further reinforces the concept that pitching and defense are among the most important components of a solid team. Hopefully those components, which look absolutely fantastic on paper, will being to look fantastic where it matters: on the baseball diamond. 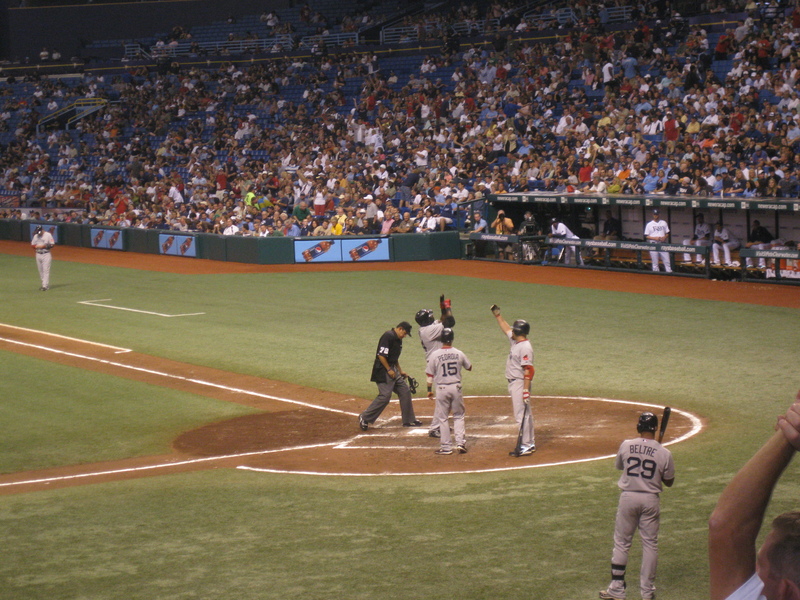 Before I go, I just wanted to inform you guys about a couple of things: First of all, I will be at the Red Sox vs Rays game next Wednesday night! This is exactly what I wanted for my birthday. My parents asked me what I wanted, and I said, “Tickets to the Red Sox game.” I have tickets 12 rows behind the Red Sox dugout, so I will be getting there when the gates open to get autographs. The only downside is that it is right in between my finals, so I have a French final the next day (four hours away), but as you can see, I have my priorities straight. And as far as summer plans go, I have been lucky enough to get a few opportunities. If all goes according to plan, I will be shadowing Dan Hoard and Steve Hyder, the broadcasters of the Pawtucket Red Sox, for a week; and Mike Antonellis and others in the media relations department with the Portland Sea Dogs for a week (or maybe more). Driving two-and-a-half hours to a game that I did not have tickets for was actually familiar territory. 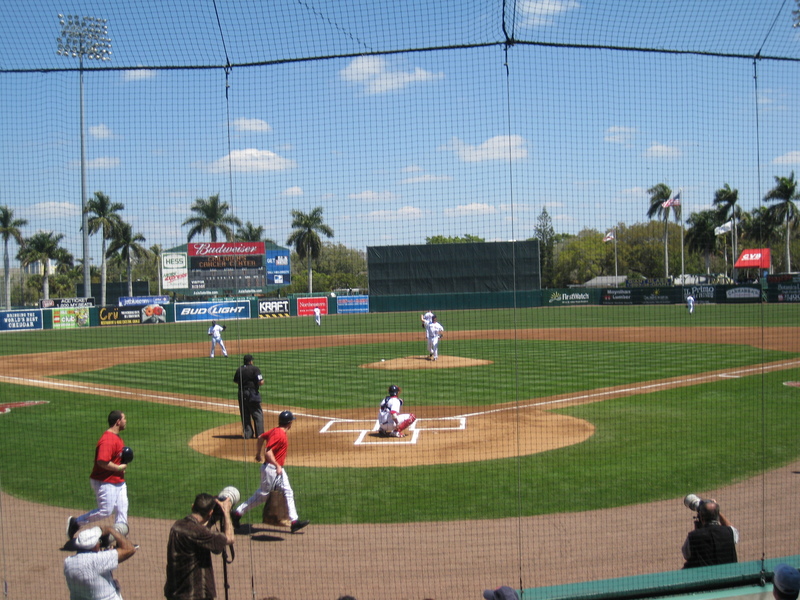 Last year, during Spring Training, my mother and I drove up to Jupiter, FL to catch a Red Sox vs Marlins Spring Training game. I bargained for the tickets myself, and I probably paid twice the actual price. You can read about that day here. The main difference between that game and the one I went to yesterday was that my mother and I actually had somewhere to go had that game not worked out. Her parents live in Stuart, which is only about 20 minutes away from Jupiter, so if the game did not work out, we would have just gone up there earlier than planned. The closest family I have to Fort Myers is my Uncle Jim (a Red Sox fan, of course! ), who lives in Venice Beach, FL. We had no backup plan. It was either get tickets (which meant buying tickets from overcharging scalpers since the game was sold out) or dejectedly go home. My friend Marissa Goldstein accompanied my father and I to what was our third Spring Training game of the Grapefruit League season. I was so happy that I could finally take her to a baseball game after all she and her family have done for me. She lives in Miami, but she is originally from Boston, and she visits her dad up there every summer. For the past three summers, I have spent a week with her and her father, Larry, up in Boston. It was through her family’s generosity that I was able to experience my first time at Fenway Park (which I should extensively describe sometime, now that I think about it)–and with great seats too. We literally sat seven rows behind the Red Sox batters’ box. Larry, Marissa, and I also experienced our first time on the Green Monster in the summer of 2007, and that was an experience that I’ll never forget. It was also through her father’s generosity that I was able to go to Pawtucket last summer and interview Dan Hoard, Steve Hyder, and Michael Bowden. I owe so much to them, so the least I could have done was to take Marissa to her first Spring Training game. Marissa, of all of my friends, knows what going to a baseball game with me entails. 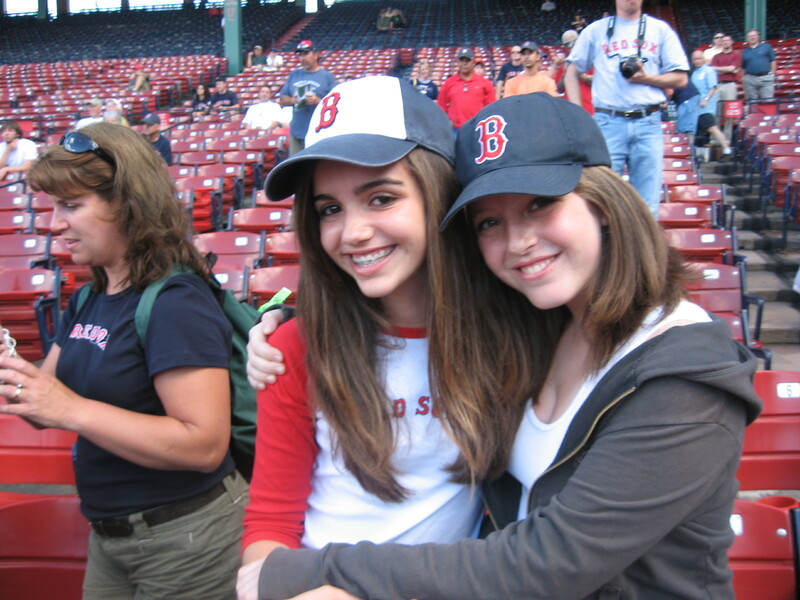 I will let her explain that when she guest blogs and writes “10 reasons never to go to a baseball game with Elizabeth.” She received nothing less than the full Spring Training experience. We left my house at 8 am, arrived at the park by 10:30, and we were looking for tickets. The first scalper we encountered was asking for more than twice the price for bleacher and reserved seats. We decided to try our luck somewhere else. With scalpers, you are never in a position of power. I am a decent bargainer, but when it comes to tickets I am easily manipulated. My father got in line to see what the box office had, and Marissa and I were going to go down the block to see what other scalpers were offering. Before we had taken three steps, my father called us back. A man had three standing room only tickets that he was selling for the fair price of $12. None of us had had standing room tickets before, but we decided to take the chance so that we could get into the stadium quicker. Marissa and I went down to the dugout. I decided that it would be best if we stood at opposite ends of the dugout, so that there was a higher probability of getting some signatures. Since many of the non-roster invitees had already been cut, acquiring a multitude of autographs was a tough endeavor. I guess I judged him a little too harshly. Believe me, I know that baseball players have jobs to do, but this is Spring Training. It’s the only time of year that the players can get somewhat close to the fans. I know signing autographs is just a nice bonus, but sometimes they forget that we pay their salaries. Jeremy was true to his word, and he came back, and signed my ball first. I told him that I remembered watching his first Major League at-bat: a grand slam. He smiled when I mentioned it. “First pitch?” I asked as he was signing my ball. He responded, but unfortunately, I couldn’t hear amongst all of the “JEREMY” calls of the fans. 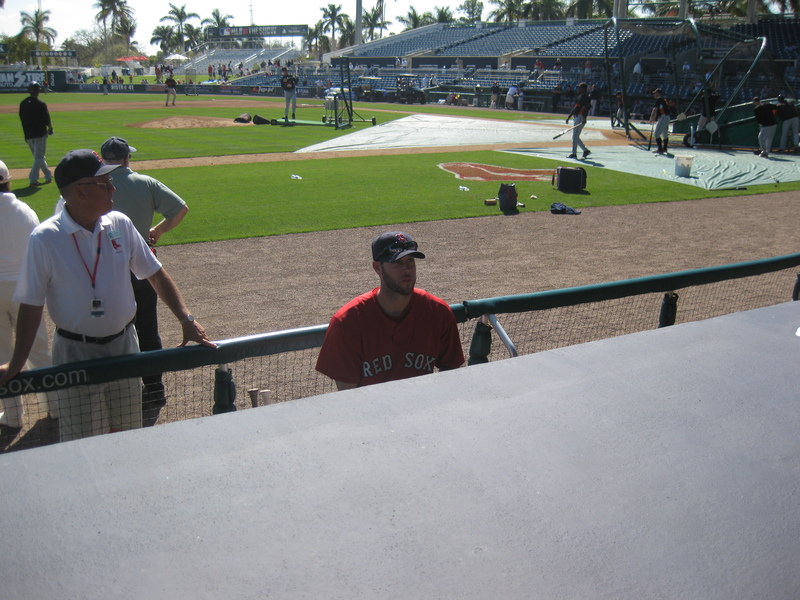 Pedroia stopped to sign for a second, just not in front of the dugout. My Dustin Pedroia salsa has yet to be signed. I always wonder how I’m going to throw that glass container of stale salsa over the dugout, but I’ll find a way. As Jacoby jogged back into the dugout, he waved to me. I may not have gotten his signature, but a wave was good enough. As the Orioles were taking BP, Tug Hulett appeared in the dugout, and once again signed for everyone who wanted an autograph. 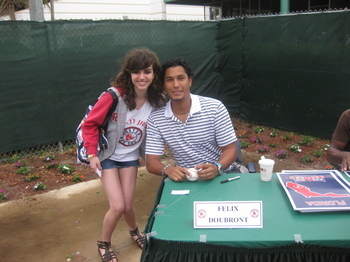 I got his autograph for the second time this Spring, and I still can’t believe how good he is about signing autographs. Jacoby signed for a couple of people before heading out to stretch, but he was the only regular who did. I noticed Angel Sanchez, a non-roster invitee still in camp, so I called to him and he signed for me. A lot of players from minor league camp had been called up for the day, so I did not recognize a lot of the numbers. Even the numbers that I did recognize were different players. 76 was not Jose Iglesias, 79 was not Dustin Richardson, 82 was not Adam Mills, 92 was not Ryan Kalish, and 97 was not Kyle Weiland. Not having an actual seat at a baseball game was a very different experience. Most of the standing spots along the wall had already been taken, so we tried to stand along the handicapped railing even though there was a sign that clearly read “Please do not stand along the railing.” We were shooed away almost immediately. We were forced to split up. After the second inning, we noticed a bunch of empty seats around home plate, so I decided to inquire. Those seats were reserved for scouts. I was a little bit offended because I like to consider myself an amateur scout. So we went up to the upper bowl, and found some empty seats up there. My dad found a seat behind home plate with some empty seats next to him, but we weren’t sure if people were sitting there or not. I was starving at this point, but you guys know me during a baseball game: I don’t get up to eat or to go to the bathroom. So Marissa was kind enough to go get sausages because she is OK with missing five minutes of a game. She claims to be the rational one. We had these amazing, foot-long sausages. Although we were high up, we were still behind home plate, so I could see the lack of spin (I mean this in a good way) of Wakefield’s knuckleball. I don’t like to settle for seats though. So I called my dad to see if seats were still available next to him, and they were. So we snuck down, pretended we had been in the bathroom (for like, five innings). We were right behind home plate. The view was fantastic. 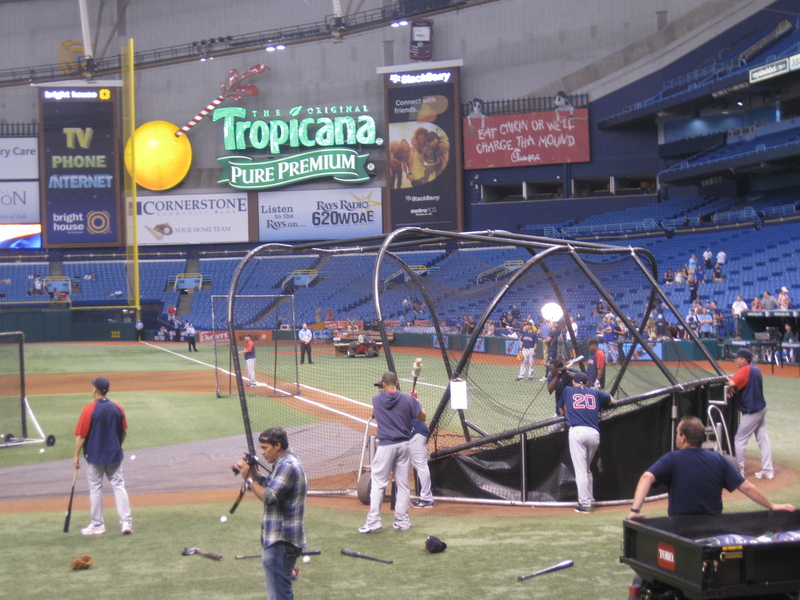 I could see into the Red Sox dugout, and I could see the pitchers’ motions whether they were right handed or left handed. We never got kicked out. Wakefield pitched five, scoreless innings of two-hit ball. Looks pretty nice on paper, right? However, personally, I did not think that he had his best stuff. I know the majority of his pitches he pitched for strikes, but he bounced more than one of them in there, which is not something typical of Wake. Granted, he hit most of his spots, but he would miss by a lot when he didn’t hit them. Obviously, he had a great outing (albeit against what was basically the Orioles’ minor league squad), but the fact that he bounced more than one pitch in concerned me a bit. Adrian Beltre reached first on a dropped third strike, which is something that you don’t see everyday. I have seen some really cool plays this spring: a triple play last weekend, and Beltre reaching on a dropped third strike this weekend. He swung at a terrible, wild pitch, but I guess that’s OK as long as he gets on base. Beltre also made a really nice play at third by tagging a guy out. Not only does he always know where the play is going to be, but he also knows which play is the best to make (if there is more than one guy on base). He is going to be a very valuable defensive asset. The guys sitting next to me (not sure if they had tickets) commented that Beltre should perform offensively as well considering that Fenway is much more conducive to hitters than Safeco Field is. Both Kevin Youkilis and Marco Scutaro connected for their first home runs of the Spring, which was great to see. The minor league call-up who impressed me the most was Peter Hissey. He connected for two line drives into center field, one of which produced two RBIs. He played in Single A Greenville last year, and I am unsure of where he will play this year. I was very impressed with him, and he will be one of my projects in progress; definitely a guy to keep your eyes on. Aaron Bates, Marissa’s first project, also had two hits, and played some nice defense at first. Manny Delcarmen relieved Wakefield and pitched one inning of scoreless relief. There has been some speculation about him because his clocks out at around 90-91 mph rather than his usual 95. This is obviously a result from his shoulder problems that hindered his performance during the second half of last season. I think that this is only a matter of building up his arm strength, which is what Spring Training is all about. Brian Shouse had a nice outing, and his delivery continues to fascinate me. It’s very different, but it looks good as long as he gets outs. Fernando Cabrera also pitched an inning of relief, and I was pretty impressed. He was up at Fenway last September, so don’t be surprised if you see him again during the course of this season. Joe Nelson, the man with the Vulcan pitch, was very shaky at first putting two men on without recording an out, but he was able to finish the game with a strikeout and without allowing any runs. Towards the end of the game, I noticed Michael Bowden was leaning on the railing in the dugout. After Nelson had recorded an out in the ninth, Marissa and I decided to head over towards the dugout to see if I could talk to him for a second after the game. “Hi! How are you?” he said. “I’m great, thanks, yourself?” I replied. “Thank you! How’s your writing going?” I could not believe he remembered me, let alone that I was an aspiring writer. “Yeah I did! I really liked it!” Wow, I could not believe that he had read it. I was so happy that he remembered me. It was not just a “Oh, hey I remember you” wave sort of deal. He leaned over the dugout to talk to me for a bit. 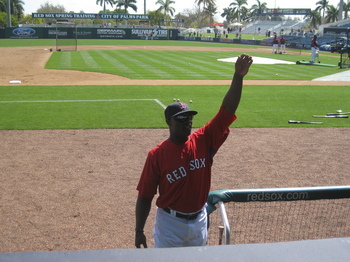 I had actually thought that he may have been annoyed when I sat down and talked to him throughout the game in Pawtucket. The next night, when the security guard discouraged me from talking to the pitchers in the stands, I thought that maybe Michael had said something to him. Apparently not. I was so happy that I had a chance to talk with Michael again. I know that he struggled at Fenway last year (which was NOT his fault), but this year he is fighting for the bullpen spot. I know that I may be a bit partial, but I truly think that he deserves the it. I think that he would have a great, positive impact because he has the same versatility that Masterson had: the ability to be both a starting pitcher, and a reliever. I will always be supportive of him, no matter what happens.